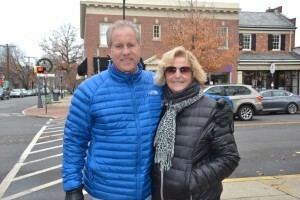 The holiday season is in full swing in Haddonfield, and families are starting to get ready for their holiday traditions. From opening presents on Christmas Eve to wearing matching pajamas, every family does something a little bit different. Hank and Catchy Schmitz, who live in Connecticut but have family in Haddonfield, have been making eggs benedict every Christmas morning for more than 30 years. Their extended family comes and forms an assembly line to feed approximately 25 people. While Hank says it’s hard to pull off, they always make it happen. The Schmitzes also buy stockings for their four children and their spouses as well as their 13 grandchildren. The Schmitzes recently welcomed a set of newborn twins to the family. Resident Gary Spatola does his best to give back around the holiday season, starting at Thanksgiving. 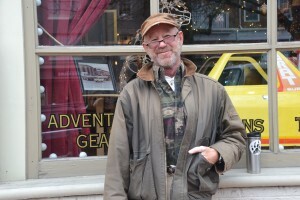 Volunteering has been a holiday tradition of his for almost 10 years, and he says the spirit of giving keeps him coming back. 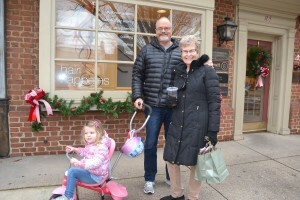 Gail and Bob Eastwick, who live in Cherry Hill but grew up in Haddonfield, enjoy going to the North Pole Express train ride in New Hope with their grandchildren and having a sleepover with their grandchildren in their holiday pajamas. They also have a tradition of opening Christmas Crackers — an English tradition of opening a tube containing a toy gift, a joke and a party hat. Gail was a teacher in Haddonfield for 26 years. 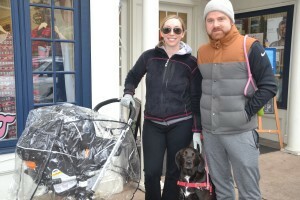 Residents Stephen and Alex Dowling are starting new holiday traditions this year, as they just had their first child. They started by getting a real Christmas tree and are keeping up with their old traditions of watching holiday movies all season long. Alex has a tradition with her mom of participating in Chestnut Hill’s Holiday on the Hill — the annual late-night shopping event that takes place in Philadelphia. Stephen had a tradition of baking Christmas cookies with his grandma, which is something the Dowlings want to do with their daughter once she gets older.